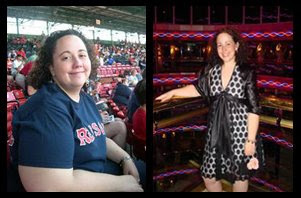 A Junk-Foodaholic's Journey to a Healthy Lifestyle: Jenn Barton lost 114 Pounds! This young lady is simply amazing. Jenn Barton shed 114 pounds and she did it her way. “My weight was something I was always aware of,” confessed Jenn Barton, 25, a social worker from Gorham, Maine, who spent her adolescence painfully shy and ashamed of her weight. From an early age, Jenn avoided anything that brought attention to her weight – posing for photos, shopping for clothes or participating in sports activities - to the point where she shunned normal social activities, outings, and even the dating scene. Growing up, Jennifer watched as her mother lost nearly 100 pounds. During this time, her mom made many attempts to introduce a healthy lifestyle and nutritious diet into the household but Jenn (along with her dad and brother) rebelled by sneaking junk food into the house. Eventually, Jenn’s out-of-control eating affected her family relationships and chipped away at her already fragile self-esteem. She felt like a “disappointment” to her mother and family members, which only made her eat even more – a vicious cycle that took nearly a decade to mend. Throughout that time, Jenn suffered numerous setbacks and humiliating incidents. She recalls one particularly hard moment: At 257 pounds, she ran in the Susan G. Komen Race for the Cure with her mother, a breast cancer survivor. At one point during the three-and-a-half mile race, which Jenn found painful and exhausting, a child pointed at Jenn and exclaimed, “Look, Mommy! The lady's so fat!” The child’s mother was so embarrassed that she swooped up the child and moved to the other side of the walking path. “I pretended not to hear and continued walking, but it's a moment I'll never forget,” said Jen. Jen was an emotional eater. She used food to calm her during difficult times and celebrated with food for special occasions. Although food was her “constant companion,” it was also her consistent enemy. “I felt out of control and as though I had no choice but to eat.” Jenn was well aware of her growing size and the negative effects it had on her body, but she felt helpless to change. Jenn thoughts revolved around her next meal or snack and she often consumed proportions meant for an entire family. When Jenn started college, she ate cheap foods like macaroni and cheese. On a regular basis, she would eat an entire box of macaroni and cheese or a half of loaf of bread for morning toast. Whenever Jenn tried to diet, she went to extreme measures that always backfired. She would either starve herself or take diet pills, both which ended up with her eventually gorging on her favorite foods. With little self control, Jenn soon outgrew her clothes. “Each time I had to buy a new size of pants, I felt ashamed and horrible about myself, though I pretended that I simply enjoyed going out and getting new clothes,” she said. “I would cut the sizes out of my clothing, so that if my friends saw my clothes they wouldn't know my size. "In my heart, I didn't believe I could change and some part of me truly believed that I wasn't even worth the effort of trying." "I vowed to change and over the course of two years, changed my eating habits and started exercising." For her eating plan, Jenn researched online and came up with a plan designed around low fat, low carbohydrate foods. For exercise, Jenn joined a gym and started out with 5 minutes on an elliptical machine. She went back to the gym every day and with the support of the gym staff and other members, continued building on her progress. Where she once feared the gym, Jenn now views physical activities as a challenge waiting to be conquered. She regularly pursues high-impact sports, such as snowboarding, hiking, marathon running and swimming. Apart from how it’s helped her appearance, it’s also provided a significant amount of energy and self-confidence. "When I donated my size 20 pants to Goodwill in favor of wearing my new size 8 pants, I cried because I couldn't believe I was wearing a single digit size. I am determined to go forward and never backwards with my weight loss. I am thankful to have the opportunity to make each day the best it can possibly be." Check out this video from NBC's Today Show! I am so PROUD of her. Beautiful! Wonderful story, phenomenal effort. You're my inspiration to get into better shape. Thank you for sharing, and congratulations on your success. Jacqueline, Viveca, and Pam: Thanks for your comments. :) I'm glad you liked the article... I did too. These kind of stories always inspire me and let me know that it CAN be done.